I always look forward to this time of year, when South Yorkshire Police organize a number of matches on the Stainy. Over the years we have had some fantastic matches; we have also had one or two hard ones as well. 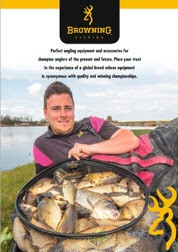 The main thing I love about these matches is the change from commercials and Carp, which are fantastic but a change now and again does you the world of good! This type of fishing reminds me of my upbringing in fishing, when I fished for Hull and District Juniors, were we fished numerous canals and rivers in nationals all over the country. The draw for today's match was held at the Delves cafe in the town of Thorne South Yorkshire. After a cracking bacon and egg sandwich we were ready for the draw. Out came peg 161, which I found out was an end peg close to Wykewell Bridge; what was even more fortunate was it was a short walk from where the cars where parked, because I had forgotten the wheel to my barrow. Plank! On arrival at the at the canal I was even more pleased to find a proper tow path had been built down the side of the canal, which made it much easier than the cloggy mud bath it used to be. On finally getting all my gear to my peg I had a quick sit on my box to survey my peg. The canal at this point is roughly 20 meters wide, with it narrowing slightly as you head towards the bridge. As the water is flat calm I can see some weed growth just under the surface, which extends 3 meters from the bank. My plan is to set up 2 rigs that will cover 3 lines. The first line will be at 13 meters in the main track. I have decided not to fish any further as the wind is due to pick up during the day, which could make fishing beyond 13 meters extremely difficult. The second and third lines will be on a top 2 plus 1 section just beyond the weed bed 1 at an 11 o'clock angle and 1 at a 1 o'clock angle. I start today's match by feeding 2 orange sized balls of ground bait at 13 meters by pole cup. (I personally prefer to do this, rather than ball it in by hand, because it is more accurate and as I have live pinkies in the mix, there is a chance the ball may break up mid flight). On the 11 o'clock I feed a small ball of liquidised bread by hand, and on the 1 o'clock line I feed a small amount of chopped worm, caster and hemp. I start the match on the 13 meter line; I am going to feed some loose maggots and pinkies over the top of this line by utilizing a small pole mounted pot. It takes around 5 minutes before I get my first bite, which is a welcome sight, A small Perch is soon in the net. This is the start of a good first 2 hours in which I am getting a bite nearly every drop in. I am getting a nice mix of Perch, Roach and Skimmers. The Perch and Roach are quite small, but the Skimmers are a slightly bigger stamp. After the 2 hour mark, bites tail of to almost a stand still, so I top up with another ball of ground bait. I decide to leave the line to settle and give the punch line a try. After a bite less 10 minutes I switch back to the 13 meter line. The fish are back and again I am getting regular bites, but this only lasts 30 minutes before the bites begin to slow. In a bid to stop the bites drying up completely I top up straight away. 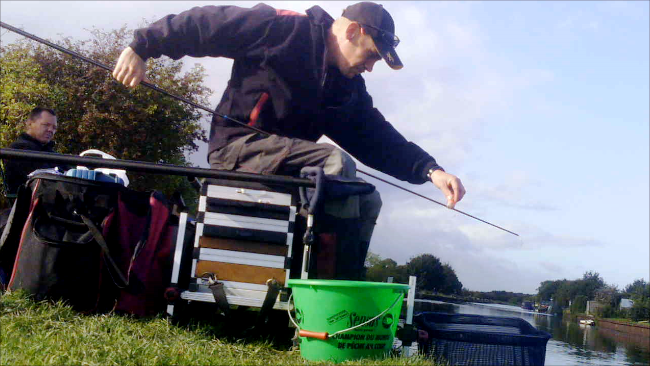 Whilst letting the line settle I try the worm and caster line, but I keep hooking weed. In a bid to sort this I add a section and re plumb the rig. I have noticed the guy in the next peg has started catching on hemp, so I decide to feed this re plumbed line with small amounts of hemp by hand, with a few casters every now and then. I try again on the 13 meter line, but bites are now very sporadic, with a couple of quick bites then no bite for a few minutes. I give the line 20 minutes and eventually bites grind to a halt . This gives me no option but trying the hemp line. I decide to start with a caster on the hook. The float is only in the water 15 seconds before it buries, and I am hooked into a better fish. A Perch around the pound mark it soon in the net, which is a welcome bonus. The last hour is spent on this line and it seems to be getting stronger as the minutes go by. The Roach, Perch and Skimmers are a much better stamp on this line. On the all out, I am in the process of landing a chunky Roach. On arrival of the scales I have 13 lb 11 to beat, which in my mind I am nowhere near; so I am highly delighted to weigh in 13 lb 5 which gives me second place. 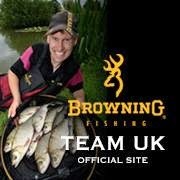 I have had a cracking days fishing, bring on next week!